When you have a lot of makeup, it's sometimes fun to dig around in your bags of goodies until you find something new to play with. Since I got my Bobbi Brown brushes, I'm able to apply bronzer much more effectively than with the old Guerlain brush that came with my Terracotta Tan Booster. 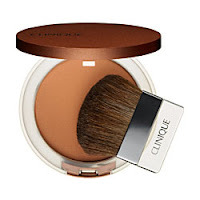 I find Guerlain a bit too muddy and orange-coloured for winter, so I've been using a free sample I got from Clinique; True Bronze Pressed Powder Bronzer in Sunkissed. In the compact, this looks quite shimmery, even sparkly (I see you recoiling over there!). However, upon application all sparkle magically vanishes, leaving only a natural, bronzed glow. It's really easy to build the colour, without looking orange or insane. When applied over foundation and concealer (I don't use powder) it lasts fantastically, and doesn't go patchy either. Another Clinique sample I'm loving is the Colour Surge Butter Shine Lipstick in Delovely. Be warned: in the bullet it looks a highly suspicious bronze colour, not unlike Rimmel's teen classic 'Heather Shimmer'. I was tempted to toss it straight in the bin. Luckily I didn't, because turns out it's a fab 'natural' colour, similar to my lip colour but with a bit more oomph. The formula is super moisturising, so it doesn't matter if you forget lip balm. It would be perfect with MAC 'Spice' lipliner, for a reddy/brown winter lip. that is a great lip color for you, like you said your natural tone but with more oomph! it's really rather pretty babe. haha, and your lips don't look mank! Not mank at ALLLLLL!!!! Rather delicious actually!!! Kinda candy-like. RWAR!! !